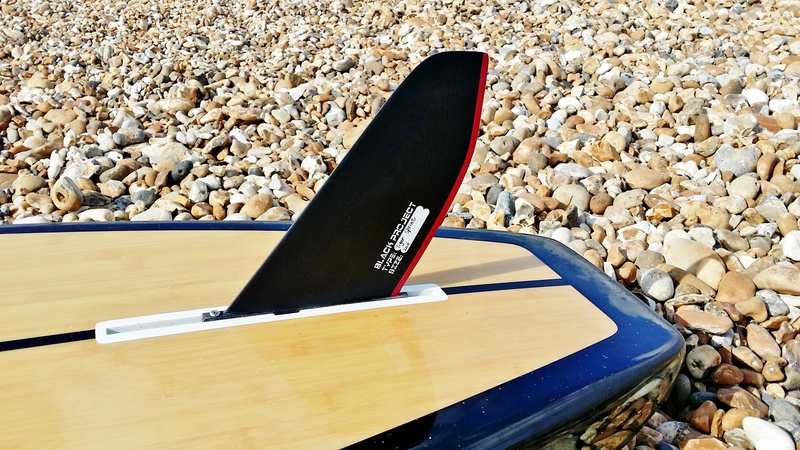 Having tried Black Project’s Maliko and Epic Pro carbon paddle (see here for Maliko fin review) we were gagging to get hold of the brand’s Tiger sprint SUP fin. Upon arrival it appeared relatively short in length – at least when sat next to its Maliko sibling. Finished to a superior level – a common trait among BP accessories – it’s certainly a foil that looks the business and we couldn’t wait to put it through its paces. Billed as a tool for faster SUP races (sprints), with buoy turns and swell bumps, it certainly feels lively once slotted in and out afloat. There’s a degree of tuning (forwards and backwards in the board’s fin box) that’s required to find optimum placement (after all every paddler and board is different) but once dialled in there’s no mistaking the performance. At top speed you can feel the lift generated, all the while prolusion is maximised, and it’s an extremely efficient foil through the water with minimal resistance. Where the BP Maliko excels over distance, keeping paddle boards straight and true, the Tiger just begs you to chuck in some turns and whip your sled round the course at a brisk rate. It adds a decent amount of stability to your SUP, even with its fairly short 20cm length. And because of the Tiger’s rake and super thin trailing edge drag is minimal leaving pilots with only one thing to do – put the hammer down and charge it! Come those buoy turns and the Tiger delivers, acting almost like an anchor for riders to pivot off without losing balance. Obviously fundamental paddling and board skills need to be in place first but there’s no denying the Tiger is a worthwhile investment if you’re a SUP racer battling across shorter distances with spins and turns. So what if you’re not into competing? Well, the Black Project Tiger is still worth a look. During testing we had the chance to tackle a number of downwind routes and while not specifically designed with this side of SUP in mind it’s a product that works well when chasing bumps and rollers – even though the Maliko is supposedly better for this. As already mentioned, the Tiger helps with board stability, once the sweet spot has been found in its box, and this transfers to downwind environments where paddlers are often faced with confused water states. The real magic is in the Tiger delivering that lively feedback without hindering paddler performance and hampering concentration. When riding rollers it feels almost like a surf fin but minus the skitty nature. Black Project have once again come up with the goods – be that in a race environment or when chasing rolling bumps. It also copes well with surfing and aids manoeuvrability which is key when facing Battle of the Paddle style wave arenas. If you’re looking to improve the current performance of your existing set up then you wouldn’t go far wrong by adding a Black Project Tiger fin to your existing arsenal.